I want that square glitter!!!! Essence Duo for sure-you know how I feel about glitter YUCK! but I must say, I am digging the square glitter-are there any other glitters you can think of that are just square alone?? I don't remember TIMW being only square? Congrats on winning the Crumpet top blogger of 2011~~ You totally deserve it! @Fingers - No, TIMW isn't square at all. It's black hex. But I can't think of another black square glitter, so it was the closest substitution I could think of. I think some of the Essence Twins sets have square glitter too (Louise/It's Purplicious, Julia, Clyde, Carrie, Victory), but again we are faced with the problem of availability... Lynnderellas have some square glitter in them, but they aren't PURELY squares... I will have to think more on this and do some research. I'll get back to you. don't pick just one! i love it with the accent nails. super fun for NYE parties! Can't pick at all! Invert it for the other hand, 3 black/2 gold, just to give each combo fair play. *gorgeous*! Lovely combo! 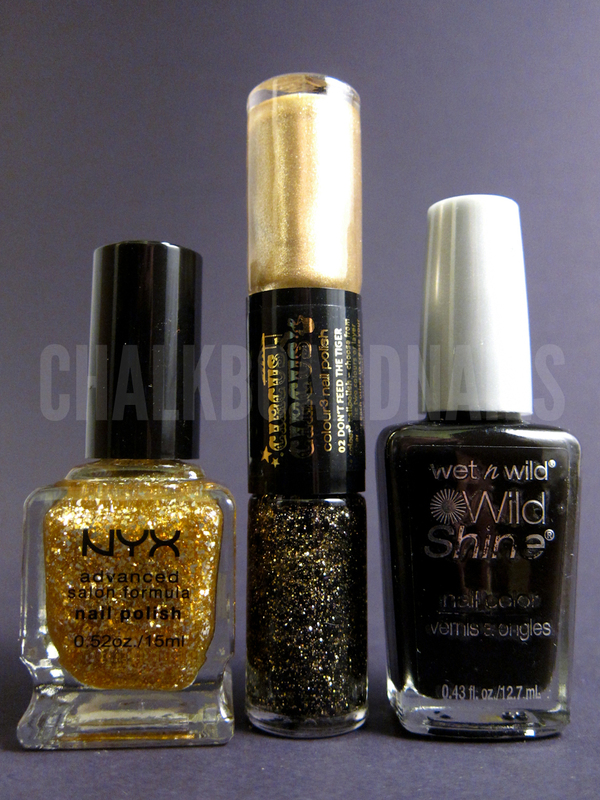 I'm absolutely torn between the two glitters, both are fantastic. As for the party manis- my friend kindly made me a franken (delicate pink with a ton of pink and red glitter) so I'll surely be wearing this. Btw, been reading you for quite a time, it's my first comment. Love your blog! I love them both and think you should keep the way it is with the two accent nails. It's funkier and more fun that way!!! Love the combination!! I think you should wear it like that! I looks great!!! WOW! I NEED that glitter pen. AMAZING! <3 awesome manicure! I am not sure yet what to wear on NYE... probably a england Perceval! Beautiful mani; it's perfect for NYE! I love the mani exactly as you have it!! Beautiful! I thin they look great like that.But my favorite is the one with black base and the the glitter gold on top.Perfect manicure for New Years.I still don't know what I am do.But I want it to be fun! ♥ the black square glitters!! I love black glitter! Don't you think it's just the best? 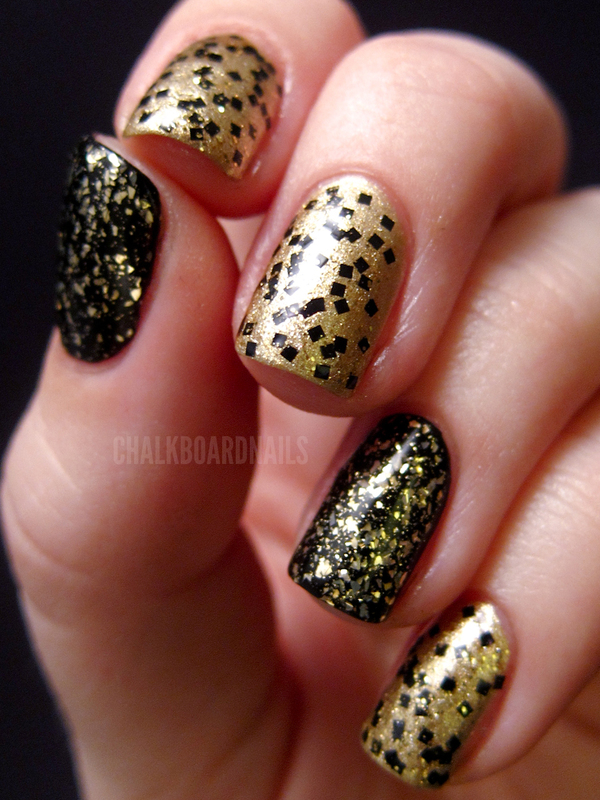 This looks like a perfect new year eve mani! Love it! I bought Don't Feed The Tiger when I was one day in Germany. I almost couldn't believe my eyes and talked for ten minutes to my boyfriend about the awesomeness and rareness of black glitter. So happy! I live in The Netherlands and Essence is easily available here, but for some reason Don't Feed The Tiger wasn't released here. I thought I had my NYE mani in my mind (China Glaze Marry a Millionaire), but now I'm in doubt.. I didn't know for Gilded Glitter! I kept searching for it (and not Gold Glitter in the DL bottle)! so great info! thank you!! I love the accent nails! look great like that! This is, as usual, great! Did you know you were linked by birchbox? I had missed this!